Amigapd would like to thank Tony Kingsmill for taking time to answer some questions about his football management game Top of the League which he is continuing to update on modern mobile phone technology. Hope you enjoy the interview. 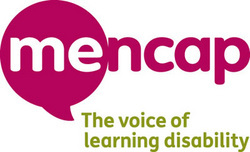 _My first taste of programming was as a kid on the Acorn Electron in the 1980s, but most of my early Basic and machine code knowledge was gained in my spare time on the Amstrad CPC. At the same time I picked up a copy of The Quill for the CPC and developed several text adventures which though pretty simplistic enjoyed some moderate success in the homebrew market. _ Was the Amiga your first experience of programming or were you involved with the 8 bit machines? _I programmed 8 bit computers for about 5 years before getting my first Amiga and it was the CPC where the first incarnation of Top of the League appeared. I ran a small public domain software library called Data PD where the CPC version was distributed for a few years. _How many games did you make for the Amiga - am I correct in thinking you released two AMOS games -Knightwoode and Top of the League? 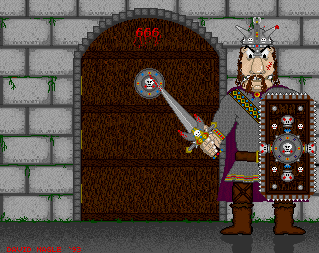 Were there any unfinished amiga games you were involved with or did all your projects get released in some form to the public? _As far as I remember Amiga things were finished but quite a few programs weren't submitted to the mainstream shareware libraries. In hindsight I'd like to have polished Bottles and Conflict Mars and submitted them to some of the libraries. Now though pretty much everything I've made can be downloaded from the Loftcat archives. 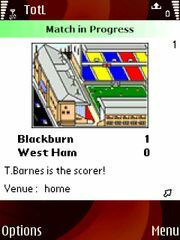 Both Top of the League and Knightwoode were programmed in AMOS - what were the advantages and limitations of using this programming language? Which programing routine caused the most problems or took the longest to complete for Top of the League (match routine - random events - save facility)? 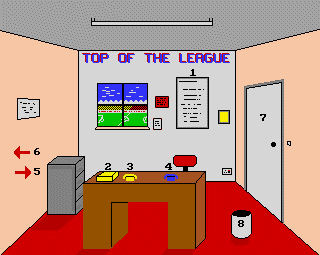 _Probably the worst aspects of Top of the League on the Amiga are the graphics and user interface. I remember buttons and controls being relatively complex compared to the drop and drag of many modern visual basic products around now. I think I fell back on keyboard control to save time, but it looks a bit dated in the modern age. In the code programming the matches to generate realistic scores isn't easy. It has to be based on statistics but there always has to be a small element of chance - there's luck in real football! _The Amos version of Top of the league only included 16 teams in each league and the opposition were only played once per season - was this due to memory limitations? _Top of the League has always been more about simplicity than realism and that was the only reason for smaller leagues. _Which games inspired you and influenced you? _The original Football Manager on the Acorn Electron, Soccer Boss on the CPC by Alternative and Championship Manager on the Amiga. _The AMOS PD Cd contains a demo of knightwoode - does the full version still exist? Yes the full version can be downloaded from the Loftcat archives. _Did you ever approach amiga magazines at the time to get top of the league or knightwoode included as a cover disk? _I never made an approach to a magazine for the Amiga version but later the Palm OS version of Top of the League did make it on to a magazine (PDA Essentials) in 2004. What was the inspiration behind Knightwode? _I enjoyed many of the Simon Avery text adventures on the Spectrum and CPC, much of Knightwoode was an attempt to do something like this on the Amiga. From the programming side of things I wanted to write a parser in Amos that could handle longer inputs than the Quill back on the CPC. Which game Top of the league or Knightwoode proved the most rewarding to program and why? _Top of the League proved far more popular but I coded Knightwoode so it's probably more rewarding in that sense. Some of the graphics in the game are poor though, which lets it down somewhat. Did you consider using the AMOS compiler to transform the AMOS code into machine code for your games? _I didn't really read up on the compiler until recent years but I've long finished Amos programming. I expect Top of the League might have benefited from the speed increase. _ Were there any interesting / amusing incidents during your programing period on the Amiga which you are prepared to share with us? _It's a long time ago now! I'm not sure about amusing incidents but I do remember the surprise at seeing Top of the League finding its way into several computer shops packed in shareware jewel cases popular in the mid-1990s. I didn't hear from the company selling my game before or after it went on sale and never received any money from them but all the same it was nice to have something I made actually being sold in shops. You mention that your amiga files will be available soon on your loftcatsoftware.com site - which files can we expect to see and will these be free to download or will there be a charge for certain items? _You can download all my Amiga titles from the Archives section - there's no charge (from the home page click on Archives at the foot of the screen). _What projects are you currently working on? Is Top of the League still evolving? _These days I'm focusing on apps for smartphones using some of the new cross platform web technologies, so at least in theory things can run on iPhones, Android and anything else HTML5 compatible. Football Cards will be available very soon via the website. Top of the League is very much alive and since the Symbian version in 2009 Top of the League for iPhone and Android is 'in the pipeline'. AmigaPd would like to thank the Tony for taking the time to answer the questions and wish him all the best with his future projects.